Sister Theresa Gerrity, S.S.J. (formerly Sister Martin Cecilia), age 94, died April 6 at St. Joseph Villa, Flourtown. Daughter of the late Patrick and Catherine (nee Bradley) Gerrity, she was born in Centralia, Pa. and attended St. Ignatius Grade School in Centralia and Conyngham Township High School. She entered the Sisters of St. Joseph in September 1946 and professed her final vows in August 1954. Sister Theresa ministered in the Archdioceses of Philadelphia and Newark. She was the sister of the late Mary E. Murphy, Nance McDonald, Rita F. Kane, Catherine T. Scheurer, Rose M. Gerrity, Sara A. Flannery, Sister Helen Teresita Gerrity SSJ, Helene L. Gerrity and Stephen Gerrity. She is survived by dear cousin Sister Barbara Bradley, S.S.J., nieces, grandnieces and members of her congregation, the Sisters of St. Joseph. 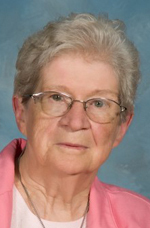 The funeral Mass for Sister Theresa was celebrated April 12 at St. Joseph Villa. Donations in her memory may be made to St. Joseph Villa, 110 W. Wissahickon Ave, Flourtown, PA 19031.